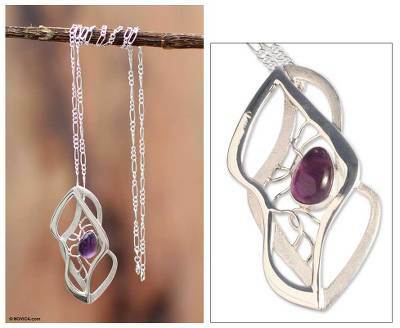 Lyrical lines and rich silver textures find a complement in amethyst. Peru's Quispe Family creates an exquisite contemporary necklace. Meticulously handcrafted, it evokes a joyous song. You can find amethyst pendant necklace 'Lyrical' by Quispe Family in jewelry categories such as Birthstone Necklaces, Amethyst Necklaces, Sterling Silver Necklaces and Pendant Necklaces. Enjoy exploring these sections for other Novica treasures. "A beautiful necklace that I wear every day"
This is a beautiful pendant that I wear daily. It is a little larger than I envisioned but it looks fantastic and attracts a lot of comments. It feels very smooth and soothing to wear. I would definitely buy other pieces by this family.